The National Oceanic and Atmospheric Administration says 2018 was the second warmest year in the Arctic, and that air temperatures for the past five years have exceeded all records since 1900. NOAA’s new report card painted a bleak picture of a rapidly changing Arctic, in which 80 scientists from 12 countries contributed to 14 essays. The report outlined several problems in the region, including high levels of plastics, algal blooms that are typically found in warm waters and the melt rate of old sea ice. “The Arctic is experiencing the most unprecedented transition in human history,” report lead author Emily Osborne, chief of Arctic research for NOAA, told the Associated Press. Arctic warming also is to blame for some of the erratic weather around the world, including a “swarm of severe winter storms in the eastern United States in 2018, and the extreme cold outbreak in Europe in March 2018,” the report said. Greenland experienced record high temperatures during the summer, then broke record low temperatures in the winter. “The warming Arctic appears to have interconnections with the wider world, specifically with unusual weather patterns beyond the region, extreme weather patterns and a record-setting heat wave in the North Pole,” said a NOAA video outlining the report. Continued warming of Arctic atmospheric temperatures in 2018 is an indicator of both regional and global climate change and a driver of broad Arctic environmental change, the report said. The oldest and thickest sea ice is down 95 percent from 30 years ago. 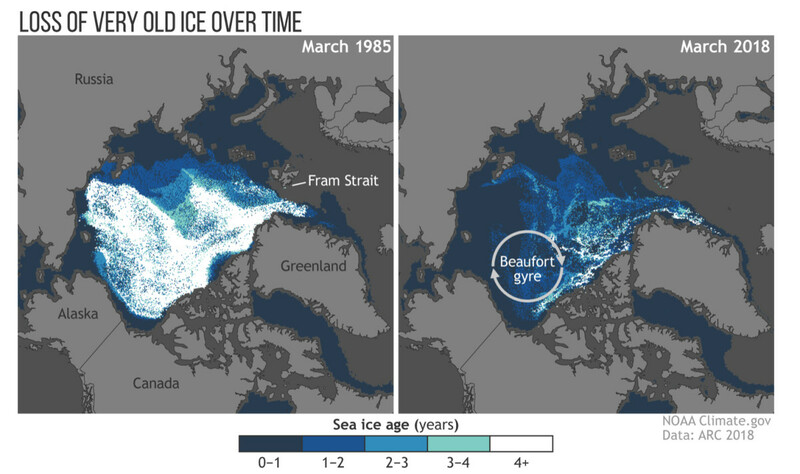 In 1985, about one-sixth of Arctic sea ice was multiyear ice; now it is about one-hundredth, according to the AP. A report issued by the U.S. government in November said the economy could lose hundreds of billions of dollars — more than 10 percent of GDP in the worst-case scenario — by the end of the century. That’s more than double the losses of the Great Recession, according to The New York Times.